Good news to every alumnus that we are going to launch our annual gathering 2008 next month. It turns out to be a DANCE PARTY this year! Surprising?! 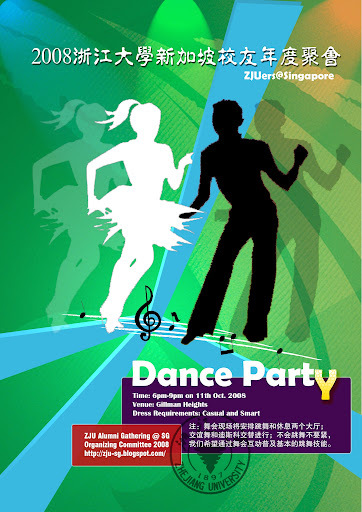 This will surely be a spectacular party for every ZJU alumnus in Singapore. What are you waiting for? Hurry up to register your attendance! Do not know how to dance? We also offer a very big chatting hall for you! Tickets will be distributed two weeks before the event. The detailed time and venue for ticket collection will be informed later. Check-in will start from 6:00pm. Please consider that the major theme for the party is to dance and communication, light refreshment will be served. For THOSE who want to attend, please kindly reply this email to facilitate our ticket preparation before Sep. 18, Thursday. We sincerely welcome you and your friends to join our party. Friends from other universities are also warmly welcomed.